February ends on a high note as I get the news that Westport's 50m tri-deck motor yacht Lady Kathryn IV sold today, with Fernando Nicholson and Rick Morales at Camper & Nicholsons acting for the buyer while Kevin Callahan at Moran Yacht & Ship was the listing broker. Lady Kathryn IV was built by the Westport yard in 2009 and is ABS classed and MCA compliant. Westport’s design and engineering teams collaborated with world-renowned designer Donald Starkey and prominent naval architect William Garden to develop a refined hull form for exceptional ocean-going performance, an innovative accommodation plan which balances interior and on-deck spaces for maximum enjoyment and versatility, and a contemporary styling that ensures lasting appeal. The six-stateroom layout with on-deck full-beam master suite affords everyone a luxurious private retreat incorporating the finest fabrics, cabinetry, stone and leathers. An innovative arrangement includes a top-deck VIP suite with its own sun deck, a large formal dining room adjacent to the commercial-grade galley, and a garage aft for tenders and water toys. 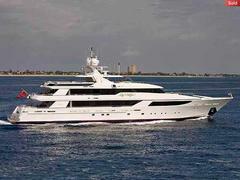 Lady Kathryn IV was asking $34.25 million.